It will be a fitting tribute to Sri Lanka’s first-ever schoolboy cricketer of the year award winner when the ICC’s Chief Match Referee Ranjan Madugalle graces the 40th Observer-Mobitel Schoolboy Cricketer of the Year grand finale to be held shortly. The 59-year-old former Sri Lanka captain has accepted the invitation and confirmed his participation at the Mega Event as the chief guest. It is a great honour to have Madugalle as the chief guest, exactly 40 years after he became the Observer Schoolboy Cricketer of the Year in 1979. Sri Lanka team, which has just commenced their tour of the West Indies, is studded with three former Observer-Mobitel Schoolboy Cricketer of the Year main award winners. The Lankan team, which is currently engaged in their three-day tour opener which ends at Brian Lara Stadium in Tarouba, Trinidad on Friday (1), is led by Dinesh Chandimal, the 2009 winner of the Observer-Mobitel Schoolboy Cricketer of the Year title. Chandimal and his men will meet the West Indies in the first Test which is due to commence on June 6 at the Queen’s Park Oval in Port-of-Spain, also in the same island of Trinidad. The 40th Observer-Mobitel Schoolboy Cricketer Awards ceremony will be held shortly at the Colombo Hilton on a grand scale. Officials from the Sri Lanka Schools Cricket Association, Association of Cricket Umpires and Scorers and the Ministry of Education met at the Colombo Hilton on Monday to finalize the nominations for awards after several hours of deliberations. The 2009 Observer-Mobitel Schoolboy Cricketer of the Year main award winner Dinesh Chandimal will lead Sri Lanka at the forthcoming away-series against the West Indies. The team left for the Caribbean Islands last Friday. Secretary of the Sri Lanka Schools Cricket Association (SLSCA), Dilshan de Silva stressed the need to make a collective effort to develop school cricket and produce quality players to feed the national team in future.“Although we belong to the Ministry of Education, our hearts are with Sri Lanka Cricket (SLC). Hence, a collective effort is needed to take school cricket to a higher level,” he said. The final selections of the most outstanding schoolboy cricketers who will receive the top awards at the 40th Observer-Mobitel Schoolboy Cricketer of the Year contest will be made shortly.The names of the most outstanding cricketers who will be considered for respective awards have already been shortlisted. But the final selections will be made by a special selection panel, headed by the President of the Sri Lanka Schools Cricket Association (SLSCA) Oshara Panditharathna. 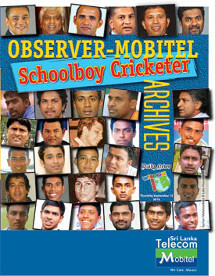 There is a four-decade long unique and memorable story behind the Observer-Mobitel Schoolboy Cricketer of the Year contest.Until 1978, there had been no formal school cricket awards show, although the country’s oldest inter-school cricket match – the Royal-Thomian, was set to complete its centenary then. There has been a greater response for the Observer-Mobitel Most Popular Schoolboy Cricketer contest as the final weeks of voting has begun with the completion of the first term inter-school matches. With only a couple of months to go for the grand finale, there has been heavy voting during the past few weeks and the contest, conducted under three divisions, should turn out to be a keenly contested tussle during its final lap. Voting coupons for the Observer-Mobitel Most Popular Schoolboy Cricketer of the Year contest appear in the Daily News, Sunday Observer, Dinamina and Thinakaran.